Here's the latest update on my 18 goals for 2018. Last month, I thought that perhaps planting the garden would be my only accomplishment this month, but I was wrong. In May, I finally finished the valances for our bedroom. Yay! This was definitely a case of me thinking it was going to be more time consuming than it actually was. I'm glad I put this on the list, because who knows how long it would have taken me to get around to it otherwise? For the fourth year in a row, we left home right after school let out. Every year I tell Hubby I don't want to do that, and every year we end up doing it anyway. 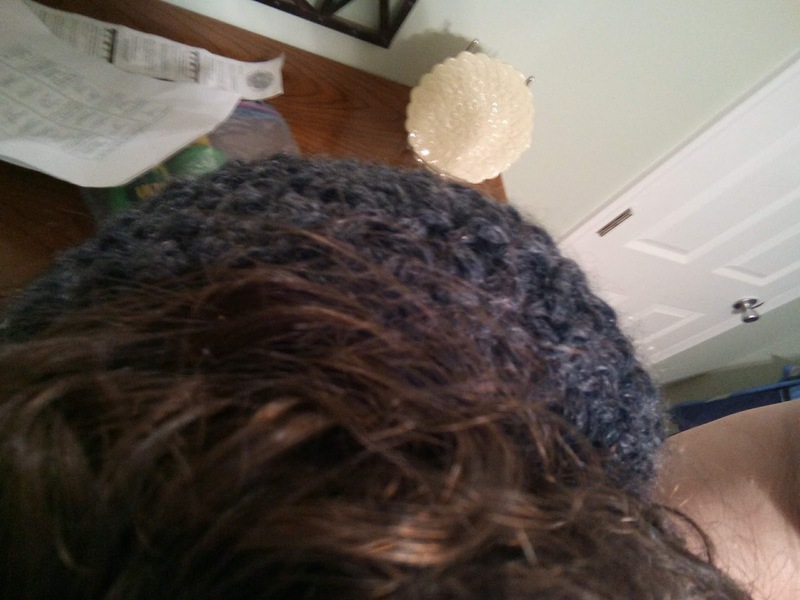 While we were gone, I managed to crochet a messy bun hat. That's "messy" modifying the hat and the bun. I used this pattern, but my hook was smaller, and instead of closing the magic ring, I crocheted it to an elastic hair band. Every time I crochet something, I marvel at how easy it is, and then I don't do it for a while and I forget and start to think it's difficult. Silly me. I also managed to send friend mail to 4 more people in May. I am totally excelling at that goal. I think perhaps next year, my 19 for 2019 will consist entirely of sending friend mail to 19 people. I picked a photographer for the boys via Groupon. Now I just need to figure out when we can go and schedule the session. So I have 8 more goals to accomplish, three of which are partially completed. Not bad--by the numbers, I'm definitely ahead. By level of difficulty, maybe not so much. I'm not sure what I'll work on in June (besides the garden). I do know that I need to finish goal 17 by August 23. I think everything else can wait, but I may surprise myself. Y'all. I don't know what we're going to eat this week. Any suggestions? We're about to start our crazy June, which will be followed by our crazy July, which will lead to our not-quite-as-crazy-but-still-busy-because-high-school-football August. Perhaps this will be a good week to go processed with our meals, while I regroup and plan for the following weeks. Except I'm not feeling at all confident that I'll be able to stop not-planning after just one week. On Sunday afternoon when I arrived at the chicken coop to check on the girls, I found the littles sitting on the roost that was above their safe space, and Toasty Crunch and Rocky in the littles' safe space digging a huge hole. Seriously. It was deeper than they were. And incidentally, that dirt under there looked really rich and nutrient dense. If I don't find enough dirt in my compost bin, I can just dig some out of the chicken run. Yeah. The time has come for full integration, because I can't keep the bigs out of the littles' space anymore. Sunday evening, I took the crate out, and the girls were on their own and fully integrated. The run seems so spacious now that the crate is out and the ramp is back in its usual location. I'm a little concerned about the littles eating and drinking. I have seen all three of them doing both, but they are interrupted often by bigs deciding to chase them. I've seen Esther come away with a few feathers in her mouth from these chases. I'm hoping they'll all calm down soon, and learn to get along. Hey everybody. Just checking in to let you know what's been happening around here. Yesterday felt like the last day of school, even though the last day of school isn't until Tuesday. I think it felt that way because final exams started for MC today (so yesterday was the last day of instruction), and it actually was the last day of school yesterday for AKD. He graduates on Saturday. He'll have to send me a picture on his first day next year. During his high school career, AKD took so many extra classes that there was actually only one class he needed to pass this semester in order to graduate. That seems kind of crazy to me, that he had enough time to take that many extra classes. MC passed his Driver's Education theory class. He worked really hard studying for the test, and we're so proud of him. The next step is Behind the Wheel, which will happen in November. Pray for us. And our vehicles. Bubby participated in his grade's track & field day on Tuesday. He ran 40 and 60 meters, and was the anchor for his class 4 x 100 m relay. He also did running long jump and standing long jump. That morning he was speculating on his chances of getting a ribbon. I told him to just do his best, and that doing one's best is definitely something to be proud of, regardless of ribbons. He had such a great time, and he did his best. He said that he was most proud of the 3rd place finish (out of about 22 teams) in the class relay, because they worked together to achieve it. I loved the way the kids all cheered for each other and encouraged one another. It's definitely feeling summer-like around here. We pretty much had 3 days of spring between winter and summer. Crazy weather. For mama's day, the boys expanded my garden, and yesterday I picked up the sphagnum moss and vermiculite to fill the new raised bed. The third ingredient is compost, which I made myself (I'm hoping I have enough)! I'm hoping to get the garden planted by the end of May. It's a little late, but considering how cold it was for so long, it's probably right on schedule. Now, of course, I need to figure out what to plant. I was planning on just doing tomatoes and a couple of jalapeno plants, because I only had one bed to work with (the other bed has strawberries in it), but now I have double the space. I'm considering just filling it with tomatoes. Tomatoes are something that I can preserve easily, and I will definitely use. Any suggestions? 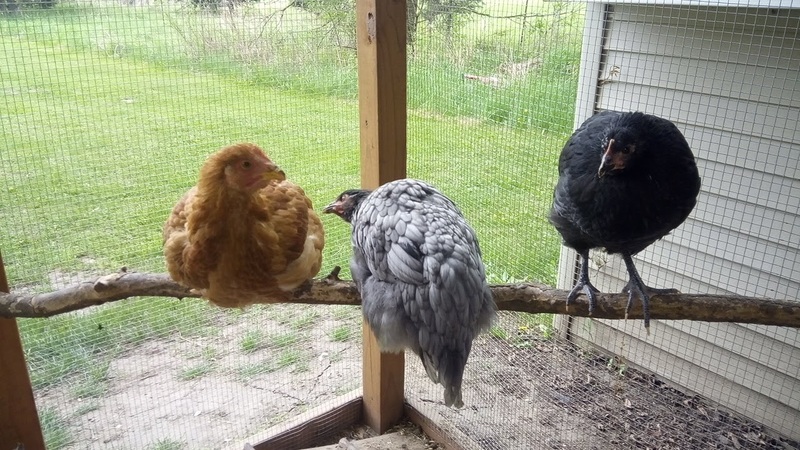 Hazel (the 10 week old chick) is just about the same size as Esther (the over a year old hen) now, so I'm not sure how much longer the chick safe space will be safe. If I leave the door open wide enough for Hazel to come and go, Esther can also come and go, and in fact, did this morning. When I went out there Esther was in the safe space, eating the chicks' food, and the chicks were all cowering in the far corner. Integration will be coming soon, ready or not. 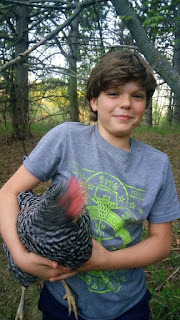 Esther is still the hen who is most likely to peck at the littles. Toasty still pecks at them when she feels like they're encroaching on her resources (food or space), but today I saw Rocky let the chicks eat from the same bowl as her (I place the bowl near one of the openings of the safe space so that both the bigs and littles can reach it) without threatening them. That's so encouraging. Hopefully the others will follow suit soon. Speaking of safe spaces, I took the fake eggs out of the nest box last night to wash them, and I didn't put them back, because I figured that by now, the girls know where the eggs are supposed to go. Well, when I was out this morning checking on the girls, there were no eggs in the nest box. I figured Toasty must be taking a break. I mean, she's an egg laying machine, but even machines need maintenance from time to time. 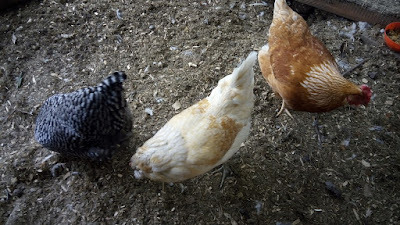 When I went out in the afternoon and there were still no eggs, I wondered if the girls had decided to lay somewhere else today, so I looked all around the run and in the hen house. Still no eggs. Toasty was acting agitated--she was pacing and looking around, then she went into the hen house and came back out. I wondered if she needed to lay but didn't see the egg so didn't know where to go, so I put a fake egg in the nest box and put Toasty into the hen house, but she came right back out. I put her back in, thinking maybe she hadn't seen the egg, and that's when I noticed two eggs in the chick's safe space. That's right: both Toasty and Esther laid eggs in an area that they weren't supposed to be able to get to. Silly chickens. Hi friends. Guess what happened on Saturday! I slept until almost 9 a.m. This is practically unheard of. Ever since the kiddos were born I haven't been able to sleep in. Of course, I was awake from 2:30-5:30 a.m. ... but I'll take it. It's crunch time, y'all. AKD graduates on Saturday, and the other kids' only have 7 more days of school. Then it's summer time. I'm not sure if the weather will behave as if it's summer, but it will be summer nonetheless. The other day I was talking to a friend, and she was telling me how sometimes her depression makes it feel impossible to get up and do anything or go anywhere. I shared with her that I understand, that I don't hold it against her or think any less of her. I also shared that I literally have to give myself a pep talk in order to get myself out of the house most days. Even if I'm going to be with people I love in a place that I love. She was kind of incredulous. She said, "it sure doesn't seem like it." And she's right. Most people think I'm normal (whatever that means), if a little flaky, because of my tendency to cancel, or not accept in the first place, social engagements. It's not something I usually bring up in casual conversation. Because I never have casual conversations. Because I'm socially anxious. Which means any conversation is a high anxiety situation. And most people think my friend is normal, too. No one knows what goes on in our brains. We don't know what anyone else is struggling with, unless they tell us. And even then, we don't really know the full extent of the struggle. Most of my friends don't realize that I have to do battle with the tyrant in my head before I can do anything that involves other people. Battling tyrants is exhausting, and sometimes the anxiety wins. I have another friend whose oldest child was just accepted into a residential program to help him or her learn to cope with their OCD, anxiety, and depression. This is serious business, affecting every aspect of this family's lives, and yet the image this family projects to the outside world is that of a normal family. If you're not in the know, you wouldn't know. Yet another friend is being verbally abused by her husband. He hasn't hurt her physically. Yet. But again, unless she specifically told you, there would be no way you could know, because from the outside, they look like a normal couple. My point here is twofold. First, don't compare someone else's highlight reel to your bloopers. Don't assume that just because someone you know appears to have it all together, to be so much more than you, that they actually are. They're not. Everybody has struggles. And second, exercise compassion. When someone is flaky or in a bad mood or easily irritated or seems irrational, there could be something going on that you know nothing about. And as much as that someone seeks to hide it, it tends to come out in sneaky ways. I'm not saying you need to let yourself be abused--it's OK to set healthy boundaries, especially around toxic people. I'm just saying, be aware, give grace. They are sure to be fighting battles of which you know nothing. The little girls are 9 weeks old. 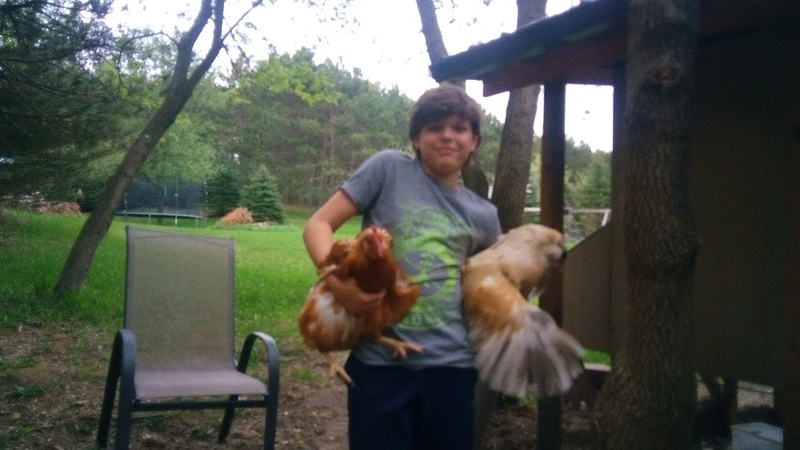 They are living out in the coop full time, and they get themselves from their safe spot in the hen house out to their safe spot in the run in the morning, and back to the hen house at night. The bigs still chase them, especially Toasty, but more and more it seems like the bigs only chase when the littles are actually in their way, as opposed to whenever they catch sight of a chick. This is progress in the right direction. Koko loves to perch. Here she was on the back of my chair. The other night she flew up to Hubby's shoulder and made an attempt at his head. Koko, more than the others, likes to come out of the safe spot in the run for a few seconds before darting back inside. Koko likes to be with her sisters, and starts distressed peeping when they're separated for whatever reason. and she's still the biggest of the littles. Toasty's voice is changing, or I should say, has changed. She's honking now instead of peeping. Her beak is OK--just the little tip of the top chipped off, and it'll grow back quickly. Hazel is Toasty's favorite to chase. 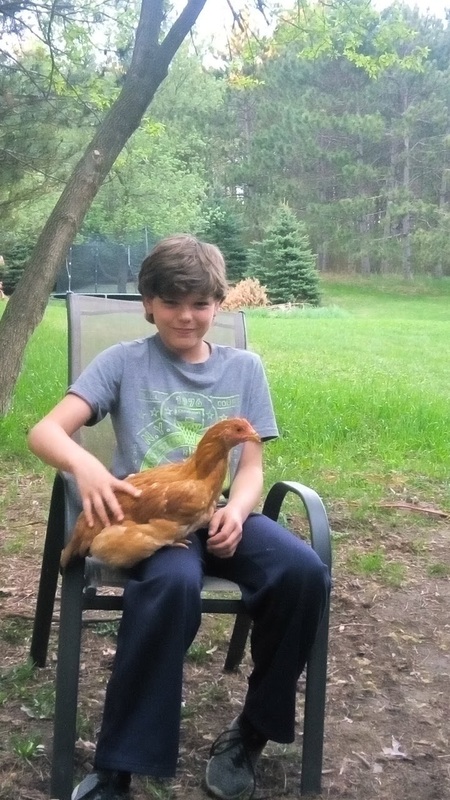 I can't decide whether it's because she's the biggest, and therefore the most "threatening," or because she looks the most like Toasty, or if it's just because Hazel is the chick most often in Toasty's way. And here's Indigo. She's so pretty with the dark lacing on her feathers. 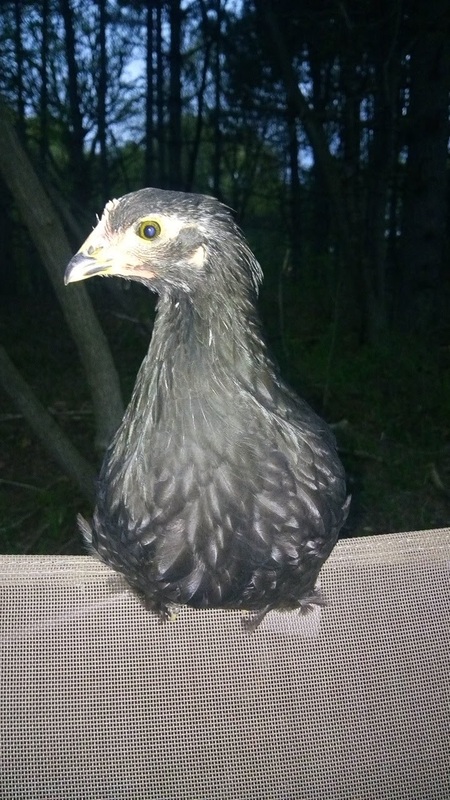 Sorry about the weird lighting--Indigo does not like to pose--she's almost constantly moving (which is a common chicken trait). As you can see, Indigo is developing a comb and wattles--Hazel is, too. 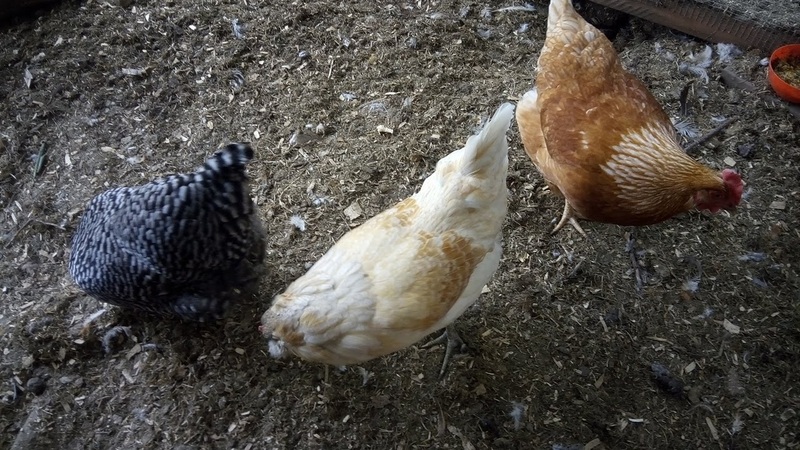 They will likely be about the same size as the big girls at 16 weeks of age, and could start laying in about 7 weeks. That's kind of crazy to think about! 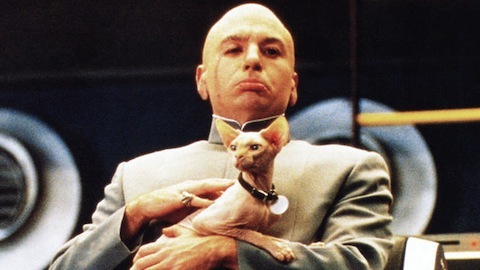 I do not, as yet, have a plan in place for full chicken integration. Obviously, there will come a point in time when the littles will be so big that the openings to their safe place will have to be big enough that the bigs (or at least Esther) will be able to get inside, rendering the safe place no longer safe. Right now, we're taking it one day at a time. 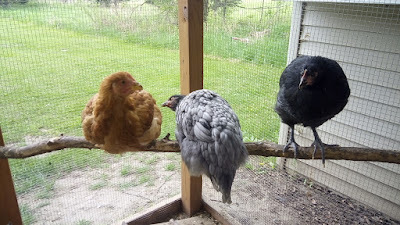 I think we'll probably take the partition in the hen house down first, since all the girls do in there is sleep and lay eggs. How much drama could there be in there? We'll see. In the meantime, everybody's growing and thriving, and I'm hoping that in about 2 months, they will all get along. It's the big girls' birthday! 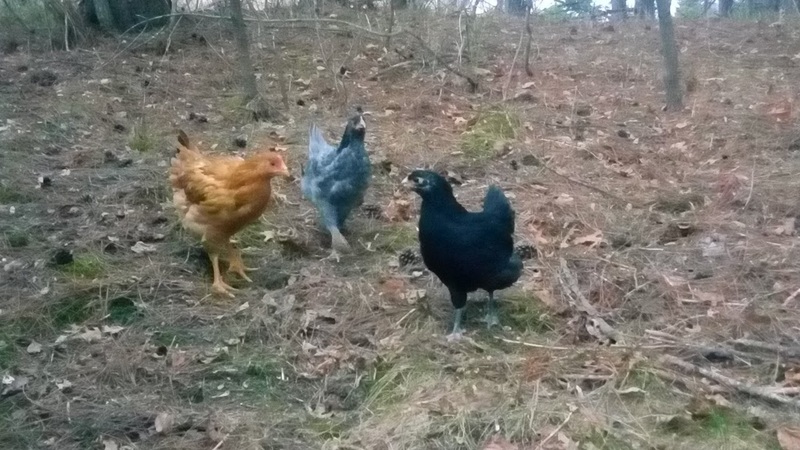 They're a year old, which means they are officially hens, as opposed to pullets. Bubby recently mastered the art of dual wielding chickens. Now he does it as often as possible. If Esther gets a wing loose, it's all over. Rocky kept moving her head when I snapped the pictures, so I had Bubby hold her still. She was still blurry for the first three snaps. She kind of looks like she's headbanging, doesn't she? I was going to make them a cake, but then I didn't. Instead I threw down handfuls of dried mealworms and black oil sunflower seeds, which they proceeded to gobble down, and then they insisted that they needed more. 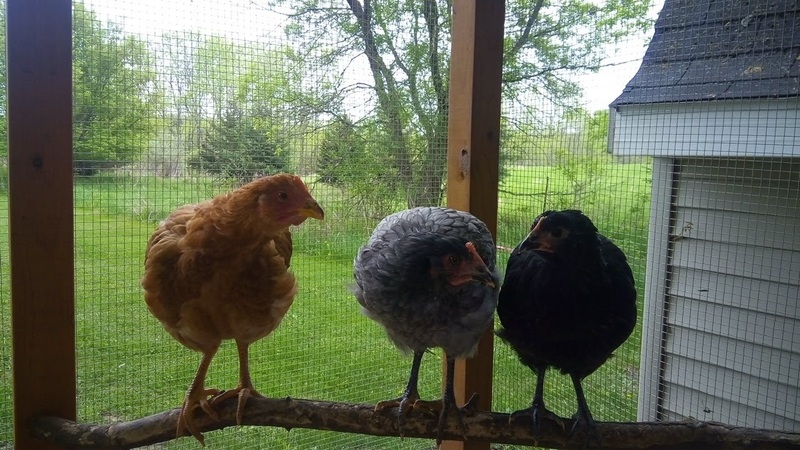 These chickens. They've added such joy to my life. 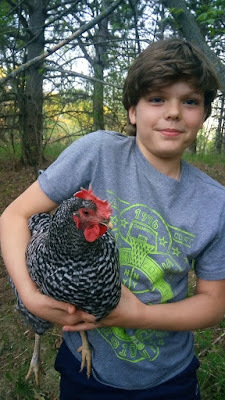 One of my very favorite things is to hang out down by the chicken coop, listening to podcasts, and watching my girls. They are my therapy. Welp, I managed to put together a menu plan this week and to share it with you. It's getting harder and harder to plan meals these days. Maybe because it's warmer, and I don't want to think about food. Maybe because of all of the regular end of the school year busy-ness (our school year is ending earlier this year, so the end of the school year busy-ness started earlier). Maybe because AKD is graduating, and the school is doling out information so s l o w l y, and we have visitors coming, and a trip to pack for. Maybe because Hubby has been traveling a lot this year. Whatever, this menu plan is quite an accomplishment, when my first (and second and third) impulse was to put fend for yourself on every calendar square this week. I really need to put this thing on autopilot. But do we really have 7 or 14 meals that we like enough to repeat that often? Not sure. Speaking of putting things off, I planned to make Sunday Night Stew on Sunday. But then I didn't. So I planned to make Sunday Night Stew on Monday. But I didn't. And then I planned to make Sunday Night Stew on Tuesday. And I still didn't. This is what I was referring to when I mentioned menu plan breakdown the other day. See, the problem was the prep work. Sunday Night Stew has ingredients that must be diced, and chopped, and minced. In addition, Sunday Night Stew takes about three hours to cook. That's after the dicing, chopping, and mincing has occurred. So I would be going about my business, and all of a sudden it would be 3:30 p.m., which normally would be plenty early to start supper, but was not plenty early to start Sunday Night Stew. On Wednesday I decided enough was enough, so I took a page out of the mama-to-infants-and-toddlers playbook: Prep supper while the baby is sleeping. Well, I didn't have a sleeping baby, so I prepped supper while the baby was sitting around waiting for it to be time to get ready to go out for the bus. And I still almost didn't make it on Wednesday! Once again, all of a sudden it was after 3 p.m., and I hadn't started the stew yet. I'm telling y'all: there is some kind of afternoon time warp in my house. I am not losing track of time because I spend hours staring at chickens. It is definitely a time warp. Not chickens. But I made it work. I reduced the amount of time the stew had available to stew, and it was ready in time for all of the household members to come together briefly for a meal before we scattered again for our evening activities. Anyway, the moral of the story is, if you're prone to (possibly) chicken-induced time passage awareness issues, set an alarm to remind yourself to start supper. Now. Let's see if I can get that shepherd's pie done today. 1. Yesterday, I finished both the shampoo and the conditioner at the same time (well, not actually at the same time, but during the same hair-washing-and-conditioning session). I feel like I deserve some kind of award, because when does that ever happen? 2. Yesterday the little chickens made it into the hen house on their own when it got dark. What a difference a few days make! This development is so encouraging to me, as in, there is hope for integration some day, although I have to say, a bit grudgingly, that the experts are right. 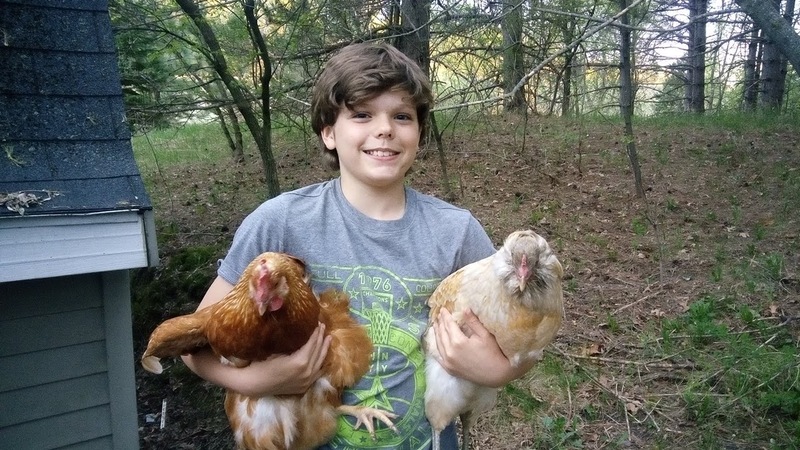 One should wait until one's chickens are the same size before introducing them to each other. Only (about) 8 more weeks to go. 3. Yesterday for probably the first time ever, I had "pick up worms" on my to-do list. I mean, I've picked up worms before, and, in fact, putting worms on fish hooks was part of my job one summer, but it's never been on my to do list before. 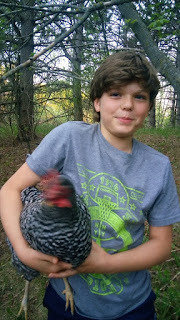 Oh, the things we do for our childre I mean chickens. They're dry mealworms, and they're a birthday present for the big girls, who will be a year old next week. Speaking of to-do lists, I wanted to give y'all a little update on mine. You might remember that one of my goals for 2018 was to obtain and begin using a to-do notebook. I really appreciate having one perpetual list of all of my to-dos. Whenever I think of something I want or need to do, I know where to write it down so I won't forget it. It's sorta life changing. I was having a problem, though. The problem was the to-do list items are all things that need to be done at some time in the future. And when things don't have a specific time to be done, they're easy to put off, indefinitely. Last week especially I was having a hard time doing anything from my list, because I kept telling myself those things could wait until tomorrow. This week, I told myself I should pick at least three things from my list to do every day. Three things, because years ago I discovered through extensive research that three items was the optimal size for a to do list. Then I realized, based on the size of my list, and the fact that I no longer have kids at home during the day, that three was too few, so I should pick five. And then I realized that it was kind of difficult to keep track of how many items I had done, because I don't necessarily do them in order. So the current iteration is this: I'm numbering the things. 1, 2, 3, 4, 5. Not necessarily in order of importance or in order of completion--just five things that for sure I need to do that day. Yesterday (of course), I only did three (of the numbered things--I actually did more than 5 of the listed things). Picking up the worms, for instance, was not one of my numbered items. Anyway, that's how I'm getting things done around here these days. Here's the second of the two posts I promised you--the April 18 for 2018 update. This month, I sent friend mail four more times, for a total of eight. That's it. The sum total of my progress on goals for April. 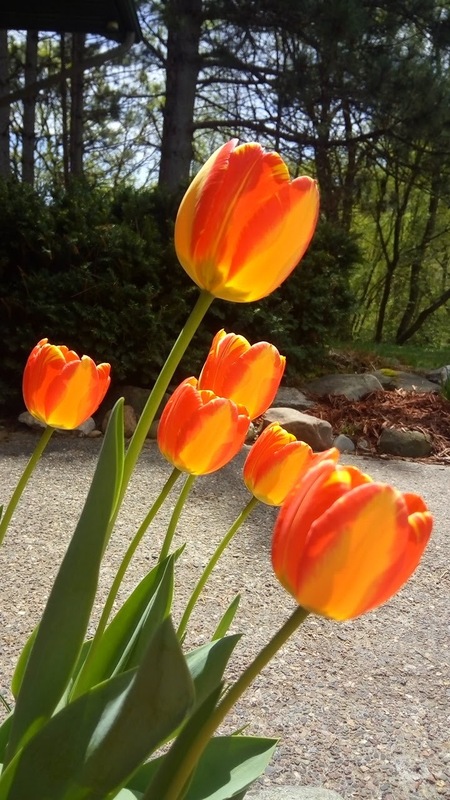 Next month, I hope to plant the garden, and I think that might be all, because of the end of the school year and summer approaching.